GARDINER, MT—With the summer tourist season now in full gear, officials at Yellowstone National Park expressed a growing sense of concern and agitation Monday about a competing 3,500-square-mile nature reserve that recently opened directly across the street from their own park. According to its detractors, the newly built Yello-Stone Natural Park, draped in strings of multicolored pennant flags and identified by a flashy hand-painted sign, is blatantly attempting to capitalize on the older location’s long-established reputation by offering similar flora, fauna, and geothermal features at a cut-rate price. Some of the numerous features of Yello-Stone Natural Park. Already reeling from budget cuts, the National Park Service acknowledged its new competitor posed a grave threat. 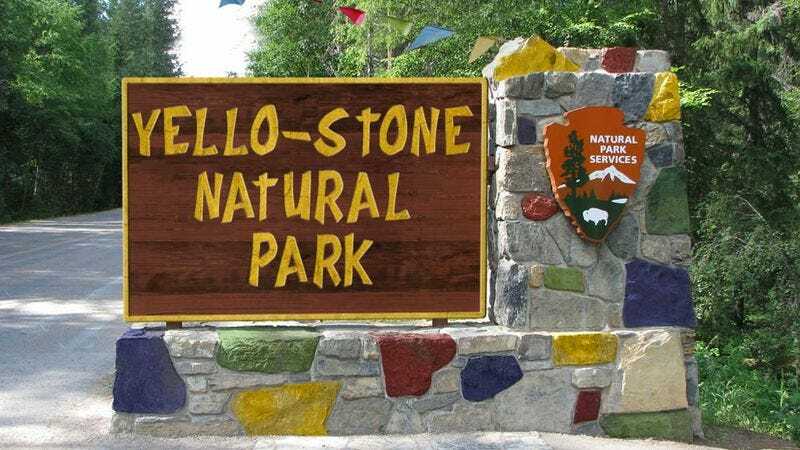 Yello-Stone’s owners have reportedly installed dozens of modern high-flow geysers, conveniently situated their most impressive ravines just 40 feet from the parking lot, and offered enticing daily promotions, such as ‘Pet a Bighorn Sheep Day’ and geode giveaways for children under 12. However, Yellowstone’s corps of rangers has taken aim at some of the new park’s most heavily advertised features, casting doubt on its claim of possessing the World’s Largest Boulder and arguing that its so-called Tomb of Lewis and Clark was “not even close” to being historically accurate. Dismissing these slick attractions and marketing strategies as mere ploys to mask “shoddy” natural features, Yellowstone chief ranger Tim Reid said many of the rival park’s waterfalls were off-kilter, its single grizzly bear appeared mangy and in ill health, and its so-called Flat Rock Plateau was actually just a vacant lot. When contacted, Yello-Stone’s principal owner Rick Zeller, whose park in Northern Arizona is credited with driving the Grand Canyon into bankruptcy in 2007, stated that he was simply exercising his right as an entrepreneur. Hoping to highlight the long history of its nature reserve and minimize visitor confusion, the NPS has reportedly instructed rangers to begin using the name Original Yellowstone Park. In addition, park officials have begun updating signs, brochures, and websites to include the slogan “Since 1872.” Nonetheless, recent attendance figures reveal that, whether accidentally or intentionally, an increasing number of tourists are visiting the newer park.